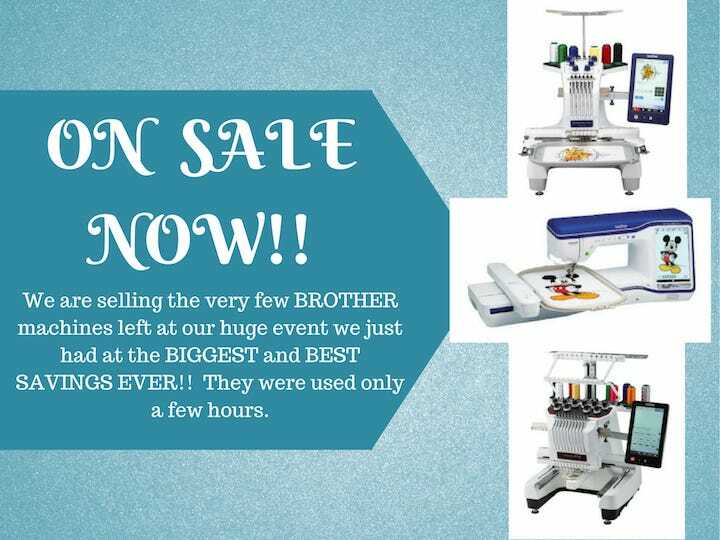 View our list of Sales and Specials on Brother machines plus more. 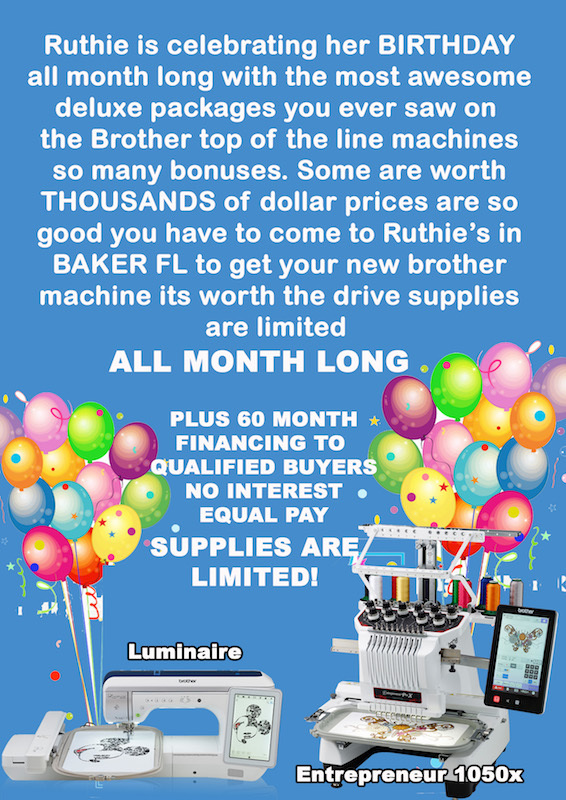 Brother Machine Specials All Month Long!!! 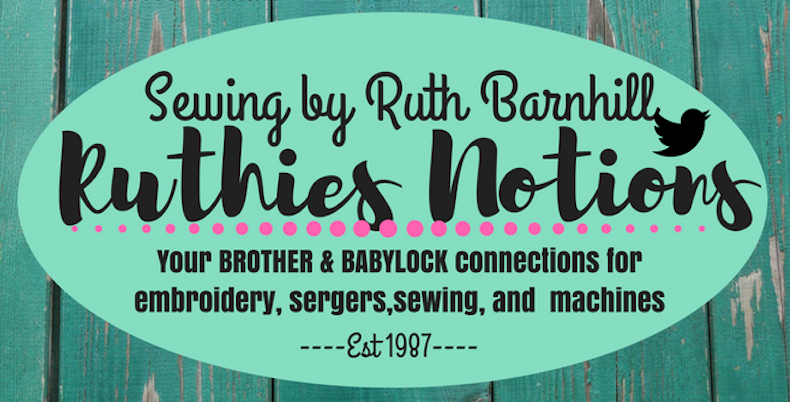 Come to Ruthie’s Notions today to see all the great deals on Brother Machines!! 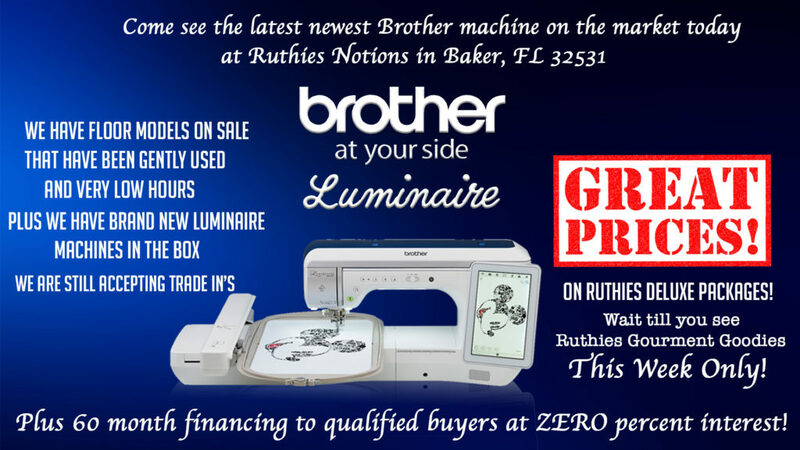 Come see the latest newest Brother Luminaire sewing and embroidery machine on the market today at Ruthies in Baker, fl 32531. 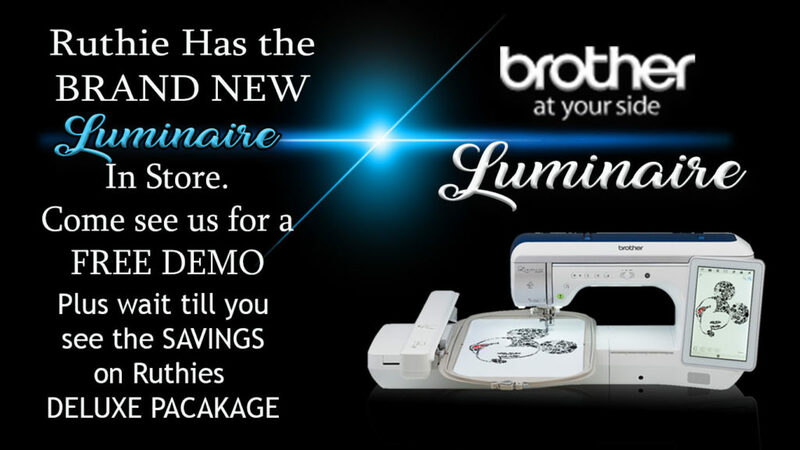 We have a floor model used only a few hours plus Brand New Luminaire at Huge savings plus our deluxe package is awesome! You will love all the goodies you will get. Don’t be sorry you didn’t come to Ruthies to get your new Luminaire. No one gives you all the gourmet goodies like we do plus 60 month financing to qualified buyers. 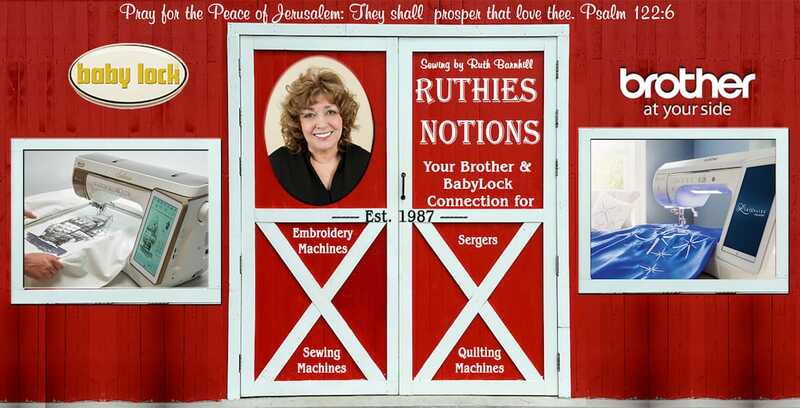 You will flat sure get your moneys worth at ruthies just ask all of our customers who buy their machines from us. People come from all over the U.S. to buy there machines from us. The best package you ever saw. Ruthies Brother’s Specials This Week Only!!!! Brand new Brother 10-Needle Entrepreneur PR1050X machines. Brother Dream Machine II! Used only a few hours! 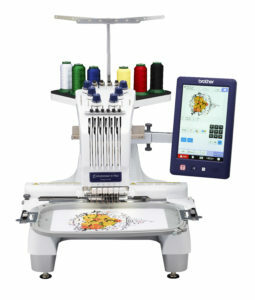 Brother 6-Needle Entrepreneur Plus PR670E! Used only a few hours!! 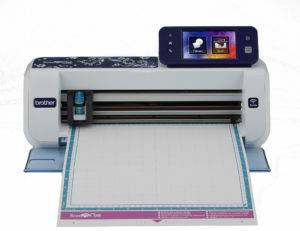 Ruthie has the Brother Scan N Cut CM650W on special THIS WEEK ONLY!! Don’t miss out on this great deal!!! 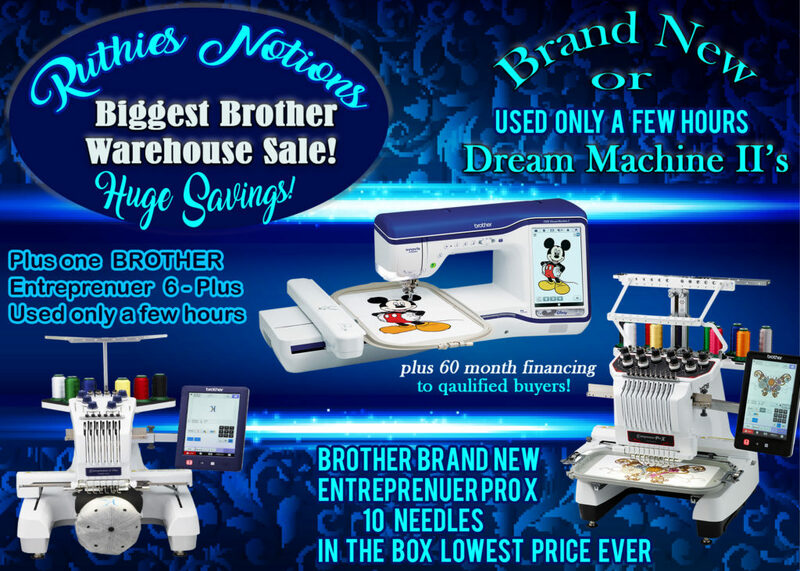 Only 1 brand new Brother Entrepreneur 6-Plus PR670E 6-needle embroidery machine. 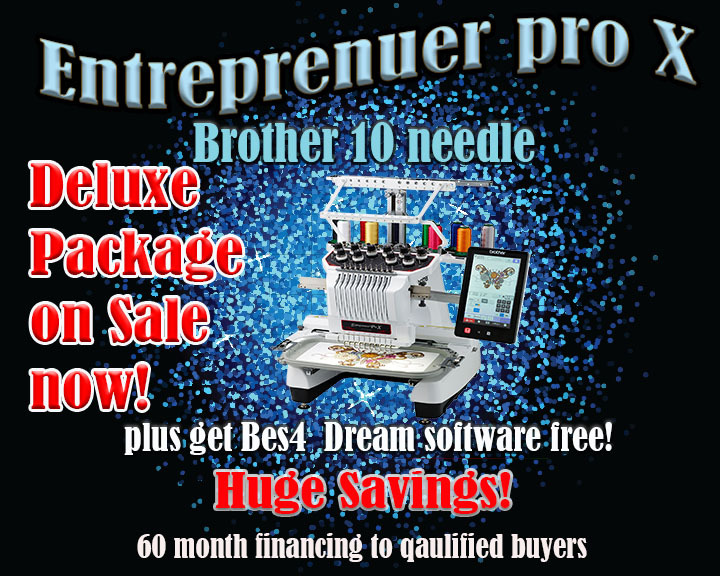 Brother 10-Needle PR1050X Entrepreneur Pro-X Deluxe Package! 60 month financing to qualified buyers. No interest equal pay. You will love the built in camera to get your placement of design just right. My Design Center, you can be so creative!!!! Why wait? Come to Ruthies Notions today and get your new Brother PR1050X. Click here to view our Baby Lock machine specials! !